Kyle Shondell has been selected to lead Indiana Tech men’s volleyball program, which begins play in 2019. 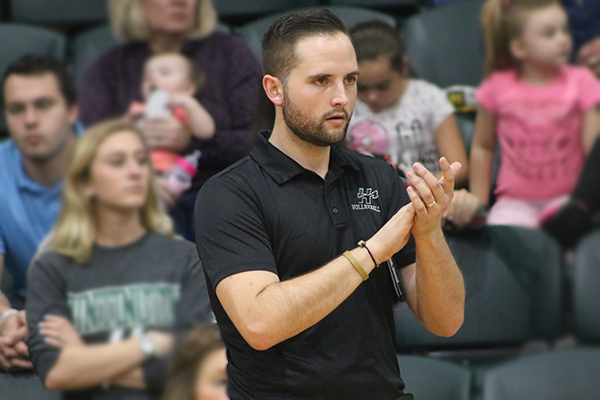 Shondell comes to Tech following a four-year stint with the women’s volleyball program at Huntington University, where he went 56-70 and led the Foresters to the Crossroads League Tournament every year under his tenure. Prior to Shondell’s hiring, the Foresters had averaged only six wins per season over the previous five years, while Huntington averaged 14 wins during Shondell’s time on the sidelines. Under his tutelage, the Foresters had 24 student-athletes earn all-league recognition, while four achieved NAIA Scholar-Athlete status. Shondell comes from a strong lineage of volleyball greatness. He is the grandson of Don Shondell, who started Ball State’s men’s and women’s volleyball programs, co-founded the Midwest Intercollegiate Volleyball Association (MIVA) and won the second-most games in NCAA men’s volleyball history. His father, Dave, is the head coach of the Purdue women’s volleyball team, and his uncle, John, is an assistant with the Boilermakers. Prior to Huntington, Kyle Shondell spent a year at Chicago State University and Western Illinois University as an assistant on the women’s side. In 2013, he was the head coach of the Rock Valley College men’s program. The Golden Eagles finished that season with 21 wins and were ranked eighth in the final NJCAA Division III poll. Shondell graduated from Purdue University in 2012 with a Bachelor of Arts in Professional Writing and a minor in history. He received a master’s in organizational leadership from Huntington in 2018. He currently resides in Fort Wayne with his wife, LeeAnn, and son, Asher.